Let’s start with UI changes. 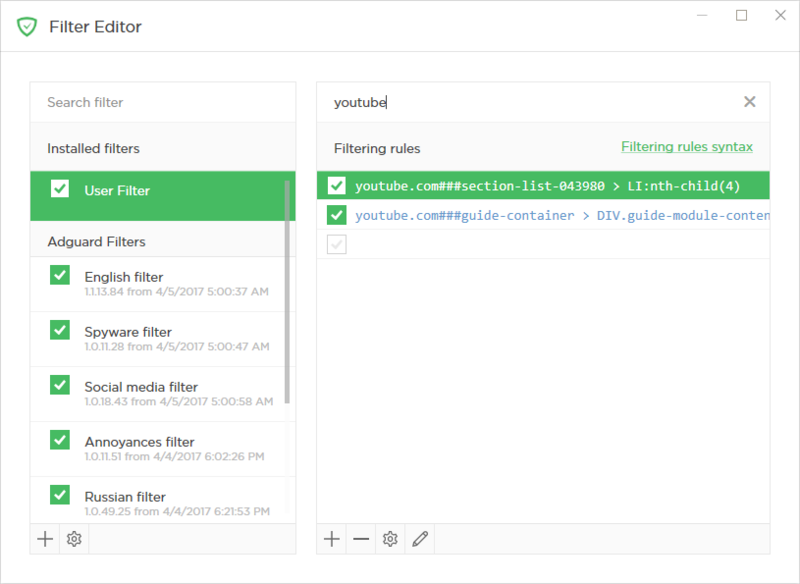 Both Filtering log and Filter editor have been seriously redesigned. We need to say a big ’thank you’ to everyone who has expressed his or her opinion because few changes depend as heavily on users’ feedback as these. We know for certain that quite a few of our users are actively using Filtering log — both for creating new custom rules and generally knowing what’s going on. So why not help them a bit? It has undergone a major renovation. 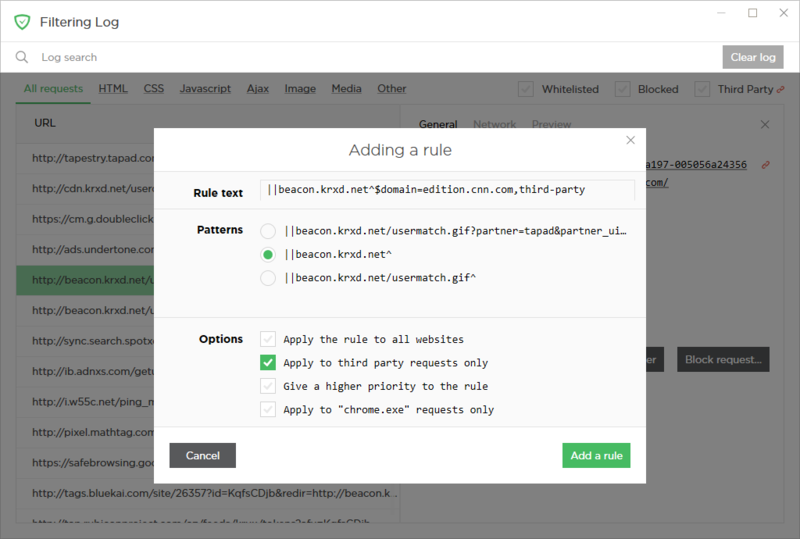 New Filtering log overlaps with Filter editor a great bit, for example, you can create new rules and unblock blocked requests right therefrom. Filter editor has also changed for the best. The addition of an ’Edit mode’ allows replacing the data grid with a text area. This lets you copy/paste/delete many rules at once without having to bother with export/import. Many Windows 10 users find the Notification center to be helpful when it comes to tracking the activity of their apps. 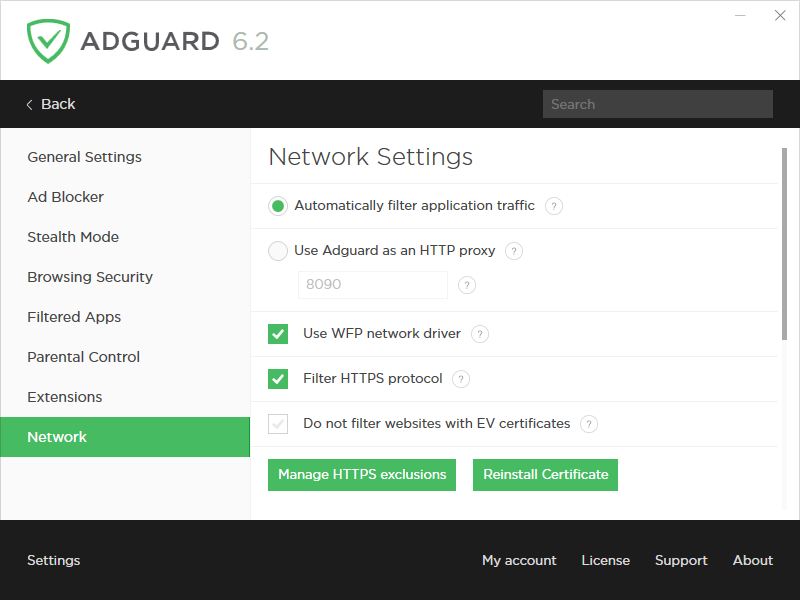 We have finally decided to take advantage of it and integrated AdGuard with the center. AdGuard has a surprisingly decent amount of various notifications. 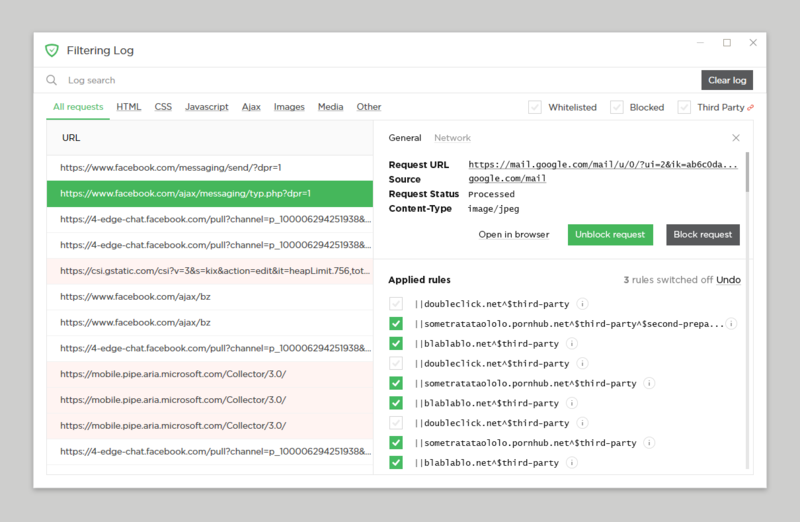 Just to name a few: notifications related to the license/trial period, automatic filter activations, new rules in User filter, Safebrowsing triggers, update checks results, etc. If you use Windows 10, you’ll be able to find them all in one place now, thus making it much easier to keep up with what’s going on with AdGuard. This one is rather straightforward. Previously, all network settings were crowding inside the ’General settings’ tab making it harder to scroll up and down, searching for the one setting you need. Adding a separate first-level tab makes it easier to navigate through the app. While not being an integral part of AdGuard for Windows, some extensions (or userscripts) have grown over time to become strongly associated with it. And we showed them some love! By the way, you may notice that the ’Report website’ button now leads to a whole new page. Basically, what you see is a web reporting tool that allows you to easily send us a report on anything from a missed ad to a false positive. More about this later. The Assistant interface overall has become smaller but retained full functionality compared to earlier versions. There is even one new feature: a switch for toggling the filtering on the website on and off. Previously, the Assistant wasn’t shown on websites with disabled filtering, and you had to go to User filter to enable it back. Oh, and we could use your help with translating the new Assistant. Did you know that anyone can volunteer as a translator? If you feel confident, head right here and find your native language. Don’t forget to read through the translator’s memo. 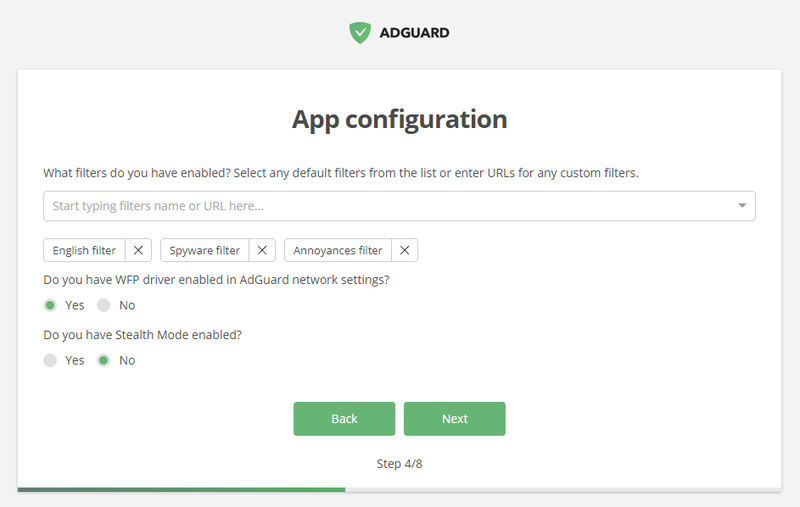 For quite a while now, AdGuard works as a userscript manager — you can install any script via AdGuard to use it in any browser. PopupBlocker has always been one of the ’native’ userscripts that are installed by default, alongside AdGuard Assistant. Its purpose is clear — to block any unwanted pop-ups. See, we didn’t lie, this changelog is monstrous! And that’s only major changes, imagine the full list! Jokes aside, we realize that it is not only hard for the users to digest all at once, but also not very healthy to unload new features in such big chunks. 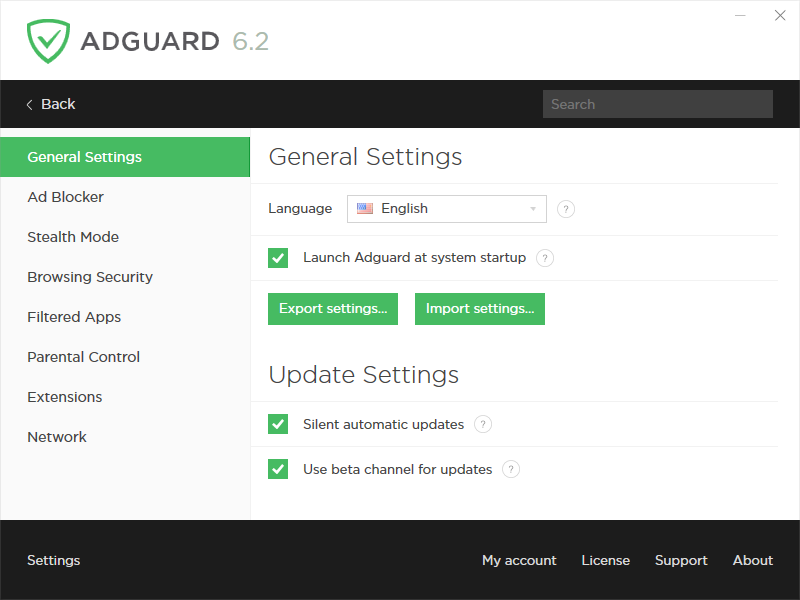 We will try to keep AdGuard for Windows updates come more steadily: with fewer changes but more often. Share your thoughts and opinions in the comment section and see you next time!